Current Sunshine has dragged her mooring and she’s caught up with another boat. Don’t worry, there’s not much damage and NSW Maritime boat is here and we’re about to tow it to the police mooring. No – there’s nothing you can do, she’s in safe hands… can’t talk any more just now. Do you find that when someone says to you “Don’t worry…” it can be a challenge to not worry about what’s going on? And for a man especially its difficult to be hanging around waiting to hear the next news. Its a call to action, and there’s no action to take. So I sat on my hands, so to speak, and attempted to be attentive to what I was doing at the wooden boat festival. The evening before I had the option of house sitting for friends in nearby Lilyfield, and because it would have been wet row out to Current Sunshine – it was bl0wing about 20 knots from the north – I opted for the more gentle option of house sitting. When Current Sunshine is at anchor I worry about her dragging, but I’ve been content when she’s on a mooring. And especially as the wind was not expected to be that strong – just a 20-25 knot northerly followed by a change to the west at a similar strength. I heard again from Rob after another hour that she was safe on the Police mooring and that he would be at the boat festival soon. At which time over a cuppa he told me how she had dragged back on another boat and her bow had made a hole in Current Sunshine’s topsides above the aft deck. Rob was the first on the scene and was in the process of running more lines to her bow from other moorings to take some pressure off where she was mated to the other boat. When the NSW Maritime boat showed up and offered to help. It was not until the calm of the next morning that I could get out to her to see for myself. The hole is mostly in non-structural parts except for the wooden pad that the rope clutch is mounted on. 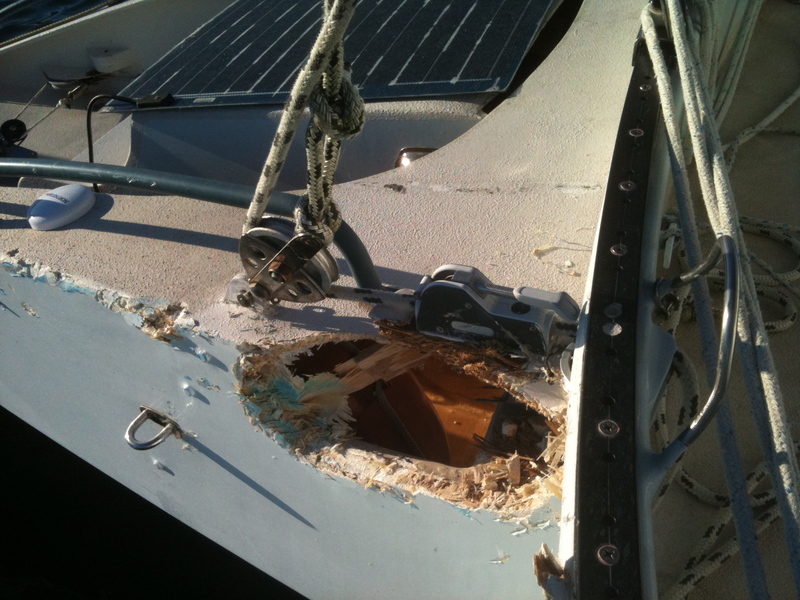 Its easy enough to fix – just a lot of fiddly work to get it to tie in evenly to the existing deck and topsides. And I’ll probably have to replace the wooden base pad for the clutch which would mean making the hole bigger. It seems that when the boats came together that was enough to stop her dragging and they sat together ok, now with two moorings holding her. 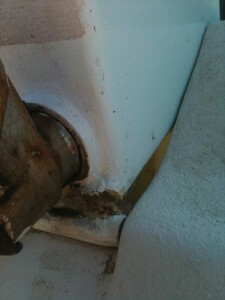 Luckily enough the other boat that she dragged onto was already damaged, so it seems that will not be a major problem. The rudder is also broken at its pivot point. The rudder was in the raised position which means it pokes out the back and it would have been the rudder that hit first and put pressure on the joint in a way that was never intended. Repair of the rudder may be the most difficult job. In the photo it doesn’t look as much damage as the hole, but I suspect it will require a lot of rebuilding – it has to be really strong. This pivot allows the rudder to be raised in shallow water, and can be fitted with a shear pin so it can break if the rudder runs aground. This morning I’ll have a better to chance to check her over more fully and be sure this is the extent of damage.